A legend amongst Los Angeles Rams fans, Eric Dickerson epitomized the culture of Los Angeles by leaving everything he had on the field everytime he played! 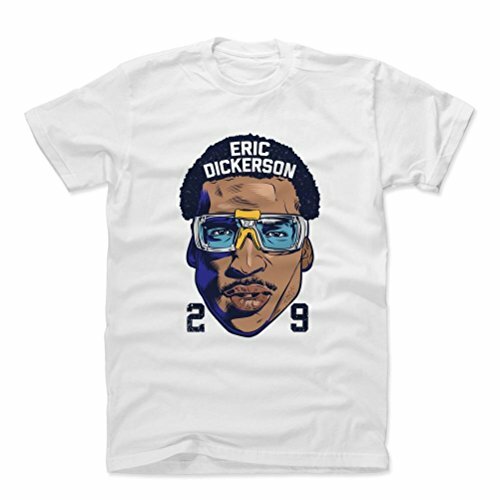 This Eric Dickerson Shirt is the perfect addition to any Los Angeles Throwbacks fan's wardrobe! About: This High Quality, Durable Cotton T-Shirt is the perfect summer shirt for those hot, sunny days at the ballpark! Versatile enough for BBQ cookouts in the backyard or any friendly get-together and party, our extremely soft, 100% Cotton Tee is less form fitting which allows for a more true-to-size fit! 500 LEVEL takes great pride in the relationships we've made and the apparel we send to our customers, so when you receive your item please take a moment to verify its authenticity and quality. If there's any reason you wouldn't rate this as a 5-star experience, please let us know right away and we'll do what we can to make it right. Classic & Old School Los Angeles Football Sports Apparel Artwork Officially Licensed and Approved by Eric Dickerson Proudly And Meticulously Made In Austin, TX Custom Artwork: Passionately Designed by 500 LEVEL artists Eric Dickerson apparel and accessories are custom and made-to-order, please allow up to 7 business days for shipping. Thank you!